The photo id for this photograph is 84, in the Schools album. This was an unknown school until Pam added a comment. 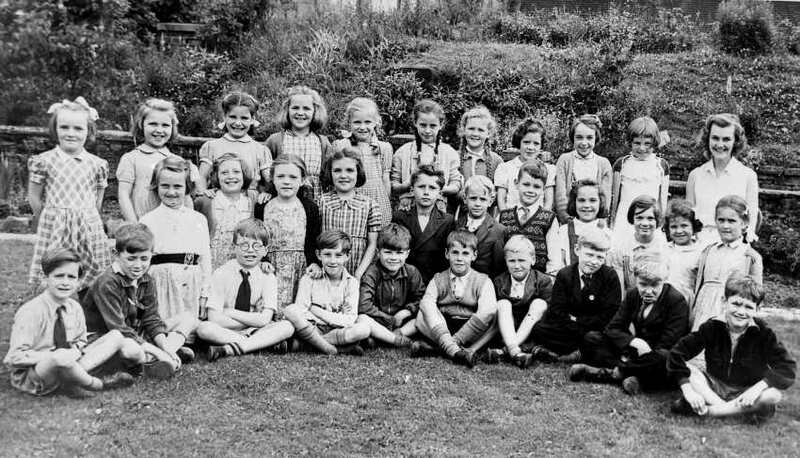 This is Whaley Bridge Primary School in 1957 - Miss Julie Nelson is the teacher. Sorry - correction it was 1955! Maureen Longden 4th from the right middle row then Philip Eaton 5th from the right. I think front row 5th fron the right is Gordon Smith. It's not as scary as Deal or No Deal. Can anybody confirm that Miss Julie Nelson is/was the daughter of Mr.Nelson who used to own and operate the Picture House/Cinema? Did John Nelson once become the landlord of the Shepherd's Arms Pub? Was he once the landlord of the Shepherd's Arms? No he wasn't but he spent more time in there than most of the landlords ever did. His mum and dad lived in the bungalows at high level just as you go under the bridge at Bridgemont they were built by Drinkwater's of Whaley Bridge. Mr and Mrs Nelson were licensees of the Station Inn in Furness for a while. They later became the proprietors of the Princess Cinema in Whaley Bridge. That is where the Co-Op Pharmacy is now. Later John took over the running of the place and he would set the projection system off and then go over the road to the Railway Hotel for a few drinks. The films would break down every now and again and somebody had to go and get John out of the pub to get it all working again. During his many hours in the pubs John became one of the best dart players in WB due to the fact he practised more than anyone else. I once went to see him compete in the News of the World darts championship qualifiers at Stockport. Unfortunately for John the zip on his pants broke when he went to the toilet before going on the big stage and he could do nothing about but it entertained the public for about ten minutes before he was eliminated. At one time he had an open backed lorry from which he sold dandelion and burdock and lemonade and so on. He used to park it outside the Shepherds fully loaded while he went in for a proper drink, Green Cream as he used to call Marston's Pedigree, and he watch through the window as the local kids used to help themselves to the odd bottle from his lorry. He never bothered. Later he had a very bad car accident and lost an eye. I heard lately that he died at Stockport a couple of years ago but he not been well for some years. There was once a trip to the Brewery from the Shepherds organised by Andrew Heyworth the landlord and, of course, John went along. The next day I called in the Sheps and John was there having his Green Cream and I asked him about the Brewery trip. "It was a good do", he said and when I asked him how much he drank he said quite casually: "about 30 pints". The coach was late so he had 5 pints before they set off. They stopped at a pub for a late breakfast; another 5 pints. At the Brewery he had at least another 5 as they were free. They stopped at a pub on the way home for a few of hours and he thought he had about 8 there. When they got back to the Sheps they went in for a quick final drink which went on for about 2 hours. "Yes about 30 must be right", he said. A fine fellow, friend of myself was at school in the village possibly 1950s. His name Stewart Swift, sadly Stewart passed away whilst living in Mjorca. Stewart lived in Banbury where we first met, and was a successful insurance broker having worked for Norwich Union Ins Co.
On the front row 5th from the right is Gordon Smith and 7th from right is me.